The Post-It® Treasure Chest is On Sale Right Now - Don't Miss It! The Post It Treasure Chest is on sale again! If you are in a rush – you can click here to grab yours. Calling all lovers of Post-It® notes! You know who you are – sneaking down the Post-It® aisle at Staples to see what new colors you can find to add to your collection. And I also have good news for you – especially if you love a surprise. You see, there is something called the Post-It® Treasure Chest . The Grand Kahuna. The object of every Post-It® fanatic's desire. Once a year – usually in August/September, this box of ambrosia goes on sale. They think that teachers are the only ones who need want a big, huge, package of assorted Post-It® notes. We know differently, don't we? Personally, I am the owner of two such chests of Post-It® treasure. But shhh!, don't tell anyone. 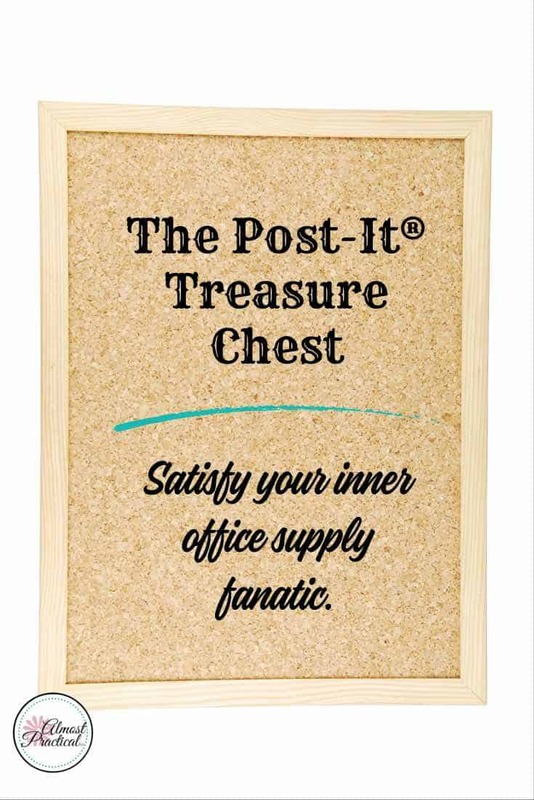 What is the Post-It® Treasure Chest? In all seriousness, though, the sale on the the Post-It® Treasure Chest is a pretty good deal. You get 10 pounds of random, assorted Post-It notes for only $59.99. And it all comes in a cute cardboard box that is shaped like an actual treasure chest. At regular price, the the Post-It® Treasure Chest runs at around $110. You cannot choose the styles, sizes, colors, etc of Post-It® notes that will be in the treasure chest that you receive. So, it is completely a surprise. I think it is a fun way to stock up on a variety of Post-It notes- but you do have to adopt the “you get what you get and you don't get upset” philosophy. I can tell you that my first Post-It Treasure Chest had a nice variety of Post-It notes. an assortment of super-sticky notes and regular notes among other things. However, the second box that I bought a few years later was a little more plain in nature – with more of the canary yellow pads but still a good variety of sizes, lined and unlined, etc. The Post-It® Treasure Chest is great for anyone that loves Post-It® notes. But keep in mind that 10 pounds of Post-It® notes is a lot. If you run a small office, are a teacher, or happen to be someone that uses many Post-It notes on a daily basis – this is a great option. Especially, if you are not particular about the sizes and colors of the notes that you use. It also makes a really fun and unique Christmas or birthday gift for someone that loves Post-It® notes but is too practical to buy one of these for themselves. Just remember that it is not always on sale. Typically I see the discount come around at back to school time only. So, don't waffle on it for too long – because I don't know how long the sale will last.